The Deutsche Oper am Rhein (DOR’s) Parsifal production originates from 1994 and the reprises are always given by DOR around Good Friday. Parsifal’s world première was in Bayreuth on July 26, 1882. Wagner had worked for 35 years on the opera, during which he wrote six others. Because of the ban that he put on any performances outside of Bayreuth, Parsifal was hardly played during its first 50 years. This fact, among others, has caused the composer’s last opera not to be at the top of the Wagner favourite list. The weak libretto with its heathen myths, Schopenhauer philosophy, Buddhist elements and Christian lessons and symbolism doesn’t contribute to a wide popularity either. The scoring however, is gentle, mellow and reflective. In Parsifal the themes are processed in the music much more than in any other Wagner opera and associated with moods and ideas rather than with people or things. This DOR production is by Kurt Horres (born 1932, Düsseldorf), who was manager of the DOR in Düsseldorf and Duisburg from 1986 until 1996. Like Götz Friedrich and Harry Kupfer, Horres was influenced by the East German Realism. Productions by all three are characterized by thorough craftsmanship and are always correct translations of musical and textual actions. Horres’ ‘Parsifal’ is conservative and controlled, and unfortunately lacks the necessary variation. Frank van Aken is a stunning Parsifal. He made his debut in Bayreuth in 2007 and was acclaimed the best Tannhäuser in years. Here Van Aken shows his ability as an excellent actor and plays the naive title role very convincingly. Parsifal demands a true Heldentenor with a rich chest register and Van Aken’s voice is both full and round. Furthermore, he has a comfortable and glorious top. With this Parsifal, Frank van Aken demonstrates that he is one of the great Heldentenors of our time. Another discovery is the Polish bass-baritone Tomasz Konieczny as Amfortas. He has an impressive breath control and produces a beautiful legato as a result. From November 2007 to 2010 he will sing Alberich in the new Ring production at the Staatsoper Wien. 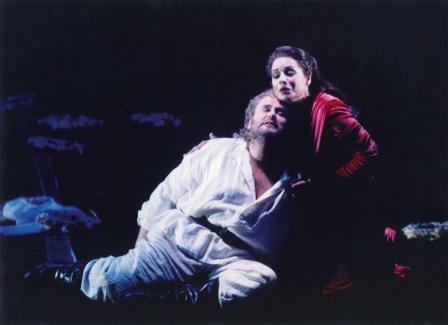 The American mezzo soprano Jeanne Piland in the demanding role of Kundry is a veteran, just like Matthias Hölle as Gurnemanz. Neither achieve quite their former vocal excellence, but experience always wins through on stage. And it is always difficult to find a bass good enough for the long solo passages sung by Gurnemanz, bywhich the best Parsifals stand or fall. Titurel is the sonorous Finnish bass Sami Luttinen and Klingsor is sung by bass-baritone Oleg Bryjak from Kazakhstan : he will sing Alberich at the Deutsche Oper Berlin this year.